Y wing styles pare a puzzle with flair. Welcome! If this is your first visit to my blog, you may wish to read some of the other blog pages first. Links are to the right, under Previous Entries. The blog has been progressing through techniques relative to approximate difficulty. 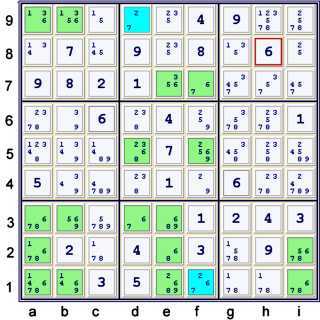 You may not find another site describing tips on how to solve sudoku puzzles that pilots this specific strategy. The phantom tactic, Y wing styles, illustrates the power of training beyond the universe of typical sudoku solving. Again, the central command point of the Y directs strength to the outposts. 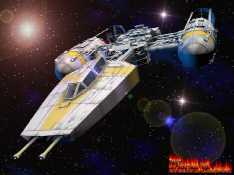 Rather than remain terrestrial, Y wing styles launches a more galactic conveyance. If needed, please refer to the blog reference page, Definitions to interpret this page. As noted on the page, Y wings, previously examined techniques limit their search for strength to specific containers within the possibility matrix. Y wing styles only limits the the number of native strong sets to three, but does not limit the types of containers considered. The table below, which I call a forbidding matrix, contains the logic for all Y wing style eliminations. At least one truth in each row, thus a minimum of three in the matrix. Usually, the last statement concludes the logic, but, in the special case whereas all the items in the first column also form a native weak set, one can conclude that each column has exactly one truth in it. Thus, the proven strong sets in each column can provide additional eliminations. This condition occurs in swordfish, naked triples, and hidden triples, to name a few. Hopefully, you can see the symmetry above that allows for both eliminations listed. When the situation above is viewed as an Almost Locked Sets tactic, the trick is to uncover the strength implied by the almost pair 13 within box h2 in conjunction with the almost singleton at a1. I mention Almost Locked Sets, as they are often the manner in which I locate similar eliminations. All the green cells are not 7. All the blue cells are not 1. All the orange cells are not 1 and not 7. Again, a more in depth explanation of forbidding chains will be presented in an upcoming blog page. Proper manipulation of this craft not only conquers more puzzles, but also targets mastery of forbidding chains. The following links are tough puzzles that can be tackled using Y wing styles. Other techniques previously covered in this blog may be additionally required. Find information about me, Steve, at the first page of this blog and My Page at sudoku.com.au. Btw,will you participate in sudoku world chapionship07? I will ask Gath if the possibilities can be ordered in that manner. Although I enjoy solving sudoku, I doubt that my speed is great enough to warrant competition. I solved the tough dt 08 jan quite easily with x-wing application. I find it much easier to spot x-wings while plotting possibilities of individual numbers and eliminating what is not possible,rather than plotting all possibilities after obvious/easy eliminations in entire grid. Please advise if this is ok.Thanks. Since, the original endpoints of the chain I posted - g2=4 == i2=4 - are also weak, one knows, without even looking at the grid, that every weak link in the chain is also strong. Thanks! Wow, what a pity for me...Why I did not consider your wrap around forbidding chains before.Yah, It will be my favorite type of chain too. I got your point:if a possibility is omitted,chances are it will turn out to be a good guess since most possibilities are incorrect anyway!! There really is no right and wrong. Without specific details, it is hard for me to make an exact evaluation of what you did on the puzzle of Jan 8. I may never quite get there in the blog. To master almost all sudoku's, though - one really only needs the information that will be in my next blog page. Am I right that today's puzzle (1/27) was pretty easily solved y-wing style, with an elimination at d1? I haven't worked on the proof of that.